Application explains inner workings of BrandShield’s technology. Last week Angie Graves, writing for Domain Name Wire, told the story of brand-protection company BrandShield. Today, the U.S. Patent and Trademark Office published a patent application (pdf) BrandShield filed covering its systems. It is one of the most in-depth patent applications I’ve seen covering a brand protection technology. The company discloses the inner workings of its technology with the hopes of gaining patent protection. It’s definitely worth reading. 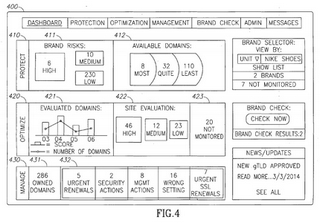 U.S. patent application 14/782791 covers “Device, System, and Method of Protecting Brand Names and Domain Names”. It details a system for scanning the web for possible infringement and then evaluating how much investment went into creating the website and how much damage it is causing to the brand holder. The application also explains how users can send semi-automatic cease & desist letters based on its findings. I imagine many of the aspects of BrandShield’s system have been used by other brand protection companies, including CitizenHawk. It will be interesting to see how the patent application progresses.